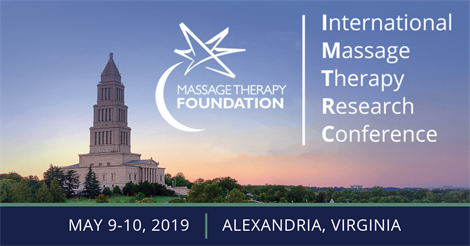 The International Massage Therapy Research Conference (IMTRC), May 9-10, 2019 in Alexandria, Virginia, is a unique opportunity to learn about current innovations in massage therapy. The conference will feature a robust line-up of speakers who will discuss the latest science and research in the massage therapy profession. Don’t miss this opportunity to hear leading researchers and colleagues discuss the role massage therapy plays in an integrated approached to care. Attendees can earn up to 8.0 CE credits. Chronic localized pain and decreased upper extremity mobility commonly occur following breast cancer surgery and may persist despite use of pain medication and physical therapy. Learn how myofascial massage is a promising treatment to address chronic pain and mobility limitations following breast cancer surgery. While efficacy of massage and other nonpharmacological treatments for chronic low back pain are established, stakeholders have called for pragmatic studies of effectiveness in “real-world” primary health care. Hear how the Kentucky Pain Research and Outcomes Study evaluated massage therapy’s impact on pain, disability, and health-related quality of life for patients with chronic low back pain. Massage therapy is gaining interest as a therapeutic approach to managing osteoarthritis and rheumatoid arthritis symptoms. Explore research on the effects of massage therapy as a stand-alone treatment for pain and functional outcomes for those with osteoarthritis or rheumatoid arthritis. Generalized anxiety disorder (GAD) is a common and costly disorder for which many patients may prefer nontraditional approaches. Learn about research on the acute effects of Swedish massage therapy (SMT) as a monotherapy for the treatment of subjects with GAD. As the United States struggles with an epidemic of opioid use and its devastating effects on lives, society and the economy, it’s important to consider the role massage therapy can play in pain management. Hear from top experts as they discuss integrative strategies to address the current opioid crisis, and the new research on the horizon. Pain is a major public health concern, affecting approximately 100 million Americans daily. Hear from leading researchers as they discuss the latest pain management science and the role massage therapy plays in an integrated approach to care.